Guyana’s Minister of State, Joseph Harmon (centre) with officials of J.K.B. Oil Ventures Limited, an investment company based in Ghana. 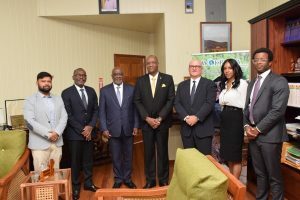 Government’s Department of Public Information reported that the team made known its position in a meeting with Minister of State, Joseph Harmon. The delegation from J.K.B. Oil Ventures Limited included J. Kofi Bucknor, Richelle Case, Emman Samson, and Sudeep Mondal. The delegation was accompanied by Mr. Mark B. Duncan of EnerMech Mechanical Services Incorporated, the oil company’s consultant. The brief meeting took place in the State Minister’s Office, Ministry of the Presidency. Mr. Bucknor said that “there are two areas that are of our interest; services for the oil and gas companies buttressed by robust training initiatives and also the infrastructure that needs to be developed around the oil and gas sector. We believe that it is very important to… spearhead an initiative to build a port facility onshore to service the industry on shore, so that we can capture a lot of the revenues and a lot of the training opportunities in country,” he said. During the discussions, Minister Harmon said that the Government is on the verge of improving the quality of life for citizens in Guyana and informed the visiting delegation of President David Granger’s vision to ensure that Guyana’s oil wealth benefit not only Guyanese, but the wider Caribbean region as well. “Guyana is a land of great potential… but that potential [was] never realised. Now we are on the cusp of realising that potential… to provide a good quality of life to our people,” he said. Guyana is expected to produce oil from March, 2020 from the Liza Phase One field offshore. With several more oil finds, ExxonMobil projects that oil production will soar to at least 500,000 barrels per day in another decade.